From the kitchen of One Perfect Bite...I lay no claim to loaves and fishes, but eggs for the multitude is another story. While I do eggs of all types, including Benedict and Florentine, once there are more than six people at the breakfast table, my unembarrassed version of the Marquess of Queensberry rules of the kitchen kick in. Those rules allow you to have scrambled eggs anyway you like them. My friend Louie got the recipe for me from a fire-breathing chef that only he could charm. The recipe defines simplicity, so I thought I could take a little time and share some egg trivia with you before we get to it. Did you know that weight determines how eggs are classified and sized? Small eggs weigh 12-ounces per dozen. The scale then climbs with weight per dozen being 15-ounces (medium), 18-ounces (large), 21-ounces (extra-large) and 24-ounces (jumbo). One large egg is about a 1/4 cup. While that's not important to many, size does matter, especially to bakers. If you try to bake a cake or souffle with jumbo eggs, you're in trouble before you start. The way around this, of course, is using equivalent measures. The color of a shell or the color of a yolk is no guarantee of quality. Eggs are like apples and color means little. Everyone knows that cracked eggs should be thrown away. Did you know that clean eggs can be kept at room temperature for several days? I'm not recommending that as a storage technique. I'm a bit of a traditionalist and prefer to keep mine in the refrigerator where they can be safely stored for up to six weeks. Eggs should be brought to room temperature before starting to work with them. It takes about 30 minutes to bring an egg to room temperature, so plan accordingly. Today's recipe can truly feed the multitudes. The recipe can be doubled or tripled as long as you have no more than 24 eggs in one 9 x 13-inch pan. Here's how it's done. 1) Preheat oven to 350 degrees F. Spray an 8 x 11-inch glass pan with cooking spray if using 12 eggs. Spray a 9 x 13-inch glass pan if using 24 eggs. Pour butter into baking dish. 2) Beat eggs, salt sour cream and milk in a large bowl. When completely blended, pour egg mixture into pan. 3) Bake uncovered for 10 minutes. Stir well, folding sides and bottom toward center and top of pan. Bake for an additional 10 to 15 minutes, or until eggs are set but still soft. Fluff with fork to form curds. Serve immediately. Yield: 6 to 12 servings. Happy Thanksgiving! Thanks for the recipe. I will use it when there are more than six at a table for breakfast at our house. Great post Mary. Because of the way eggs are now being weighed (per carton rather than individually), it's very possible for a carton to contain eggs that are vastly different in size. All the more reason to weigh them, especially when baking! Also, egg yolks have been shrinking in recent years. Yet again, all the more reason to weigh them. A quick way to bring eggs to room temp, place them into a bowl of warm water. They will be ready to use in just a few minutes. PS - can't wait to try your oven method! What a great post and so many useful info. Your eggs look delicious. What an excellent recipe for a family ( us ) who has a lot of chickens producing a lot of eggs,and this weekend, a LOT of people here for breakfast. This would be nice accompanied by your maple butter on homemade biscuits! Such a great way to fix eggs for a crowd--they look wonderful. I never ate oven kaked eggs but it looks so good I will try it. I was intrigued to see how scrambled eggs could feature in an Outdoor Wednesday post but you got me straight away with the roosters! So lovely! I'm sure you're getting busy busy busy with all the preparation for this coming thanksgiving. However, Happy Thanksgiving to you & your family. Have a great time. Cheers. Wow...baked scrambled eggs! How can one live as long as I have and never heard of these?? Sounds so nice and easy for a crowd. Thanks much for the recipe. Mary, this is a wonderful recipe to have with the holidays upon us. I love a big family breakfast, put it is so hard to have everything on the table at once. But this recipe does the work, so the cook can concentrate on other things. Many thanks and I hope you & your family have a terrific blessed Thanksgiving Day. Happy Thanksgiving, Mary. 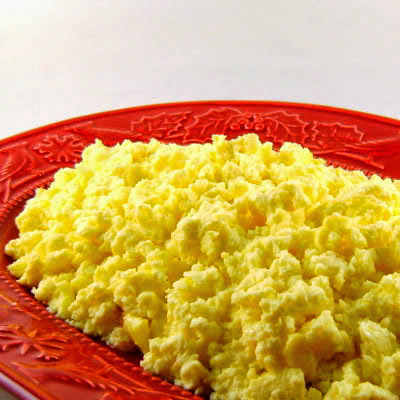 What a great way to prepare scrambled eggs for a group. They're always a favorite. I'm celebrating my 1st Blogoversary at Happily Retired Gal and sharing photos of Molly at Dog Beach at Small Reflections. Happy Thanksgiving! I did not know that about eggs- good info. And this is a great idea for a lot of breakfast eaters. Guess I will pass on this breakfast as I am not a big egg eater. Wish I was having lunch with you Thursday. I know it ill be a meal fit for a king. Blessings always. I'm an egg person and never knew some of the tips you wrote about eggs. Thanks Mary, your blog is so informative...I love the way the scrambled eggs look and the recipe sounds great. Have a nice Thanksgiving! Those sound like proper scrambled eggs. I hate runny or squishy ones--these look soft and tasty! Thanks for the recipe. I'm copying this one for Christmas entertaining. Sheila, if I can't for whatever reason get large eggs, I'd opt for the next larger size. I would then beat the egg and measure, skimming off any excess over 1/4 cup. I've never baked scrambled eggs before - they look perfectly done. I hope you have a wonderful Thanksgiving Mary - see you next week. The eggs look perfect. Happy Thanksgiving Mary! I've never baked scrambled eggs in the oven before but it sounds like a terrific idea. I don't like them overcooked (as I did as a child). Mary~ I'm strolling in to catch up and especially to wish you and your loved ones a Happy Thanksgiving! I do love this - I use sour cream and chives all summer ... when I ... errr. .. have chives! Yes, Eggs benedict gets tricky when there's a lot at your table. Happy Thanksgiving to you and yours! Happy Thanksgiving! I would have never thought about baking scambled eggs. Yum sounds good. This recipe for eggs is one I'm definitely going to try - and it sounds so easy! Happy Thanksgiving! This is really a terrific recipe! Now I should plan a brunch! wow I've never baked scrambled eggs before. Have to give this a go soon! I love this recipe for baked eggs...I'm going to try this very soon! Wishing you and yours a very Happy Thanksgiving! What a hoot! Sour cream? Gotta try this one. Love my scrambled eggs so this looks appealing. Wow ok, reading your story just made me realise how little I know about handling eggs. I generally just take the eggs out of the fridge and use them straightaway. But this is definitely an interesting recipe. I've never thought to use the oven to cook scrambled eggs. I can't wait to try this. I have 10 children & making eggs for them all takes forever on my little frying pan in small quantities. This will speed things up for sure! Thanks!